WELCOME to "This is a true story. 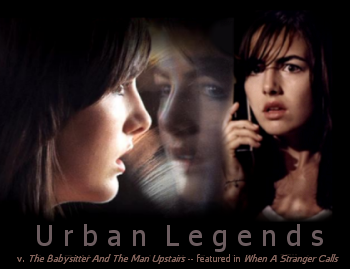 It happened to a friend of a friend..." the Fanlisting for URBAN LEGENDS. I've been fascinated with Urban Legends for years, especially the creepy ones, and sometimes I'll spend hours reading about them, even if some of the stories are ones I've read before. This layout features one of my favorite Urban Legends, The Babysitter And The Man Upstairs -- played out in the movie, When A Stranger Calls. If you are a fan of Urban Legends, grab a button if you have a site, and fill out the join form to add your name to the list of fans!